Browse a factfile about Elizabeth I and Tudor times. Explore an online guide to Elizabeth I with photos, videos and fun facts. See a portrait of Elizabeth painted to commemorate the most famous conflict of her reign, the defeat of the Spanish Armada in 1588. Find Elizabeth I in a timeline of Tudor and Stuart monarchs. (Launch the interactive timeline and click on "The Houses of Tudor and Stuart". Discover more about Elizabeth's father, Henry VIII, and his six wives, children and life at his Windsor castle. See a portrait of Anne Boleyn, Elizabeth's mother. Line drawings of Elizabeth I and other Tudors to print out and shade in. 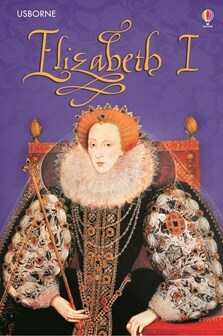 A colourful and beautifully illustrated biography of one of England’s most famous monarchs. Locked in the Tower of London, Elizabeth is never expected to become queen. This is her incredible story, from outcast Tudor princess to a great ruler who led her country into an extraordinary Golden Age. Part of the Usborne Reading Programme of over 300 books, specially developed with reading experts. Young Reading Series Three is for fully confident readers. This book is really interesting and has lots of information. There are lots of good illustrations. I think this would be suitable for readers aged 7 .